Guatemala Insight by Elizabeth Bell, author/historian. 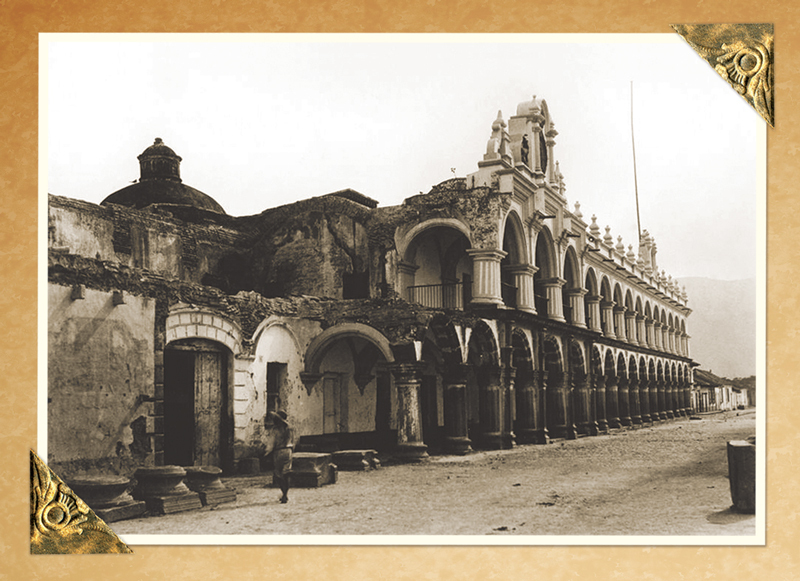 Old drawings and photographs of La Antigua Guatemala have always fascinated me. They take me back in time to when Antigua truly seemed almost abandoned. We know very few people stayed after the official move of the capital to Guatemala City in 1773. While we have some historical records from the 1800s and few drawings by travelers, the true records come with the visit by the Englishman Edweard Muybridge in 1875 sponsored by the Pacific Mail Steamship Company. His photos of the plaza and La Merced take us back in time to a city that had very few inhabitants. While other photographers focused on the coffee industry and portraits, the Japanese immigrant Kosei Yasu (known as Juan Jose de Jesus Yas) added to photos that show Antigua at the beginning of the 20th century. Our favorites include those of the Royal Palace of the Captains General—where we clearly see the damage from the 1774 demolition by the Captain General Martin de Mayorga—and photos of the kiosk in the Central Park. Yas (1846-1917) left behind a fabulous collection of photos that allow us to document the change in this monumental city. Carlos Francisco Juárez Arrazola (1927-1997) established Foto Flash in 1938. 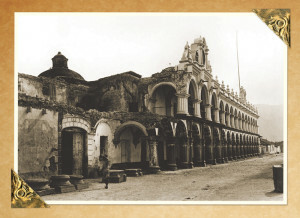 His son, Hugo Juárez, continued with the Yas school—moving to Guatemala City and then returning to Antigua, where he established Foto Juárez in 1959 after his father’s death. Post cards and albums had already become a major part of the documentation of the city’s changes. In reviewing the collections at CIRMA and the CNPAG in Antigua and the private Juárez collection, along with historical studies by Arturo Tarcena Arriola and Rosina Cazali, we have a true sense of how the city has evolved since 1875. A quiet town truly came to life. Now we have a number of excellent photographers in Antigua (like Nelo Mijangos and others) whose works we enjoy on Facebook. It turns out that 70 percent of Antigua’s population is updated on Facebook. The old photographs I share get more “likes” than any others! After such a new interest in old photographs, the curator, Dr. Alberto Garín, requested that I give a talk on the subject. It will include more than a year of extensive research.